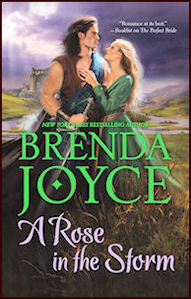 When my publisher asked me if I would like to write a series of romance novels set in the Highlands, my immediate reaction was yes—if the period could be medieval. And as I began to dig into the era, I never imagined that such a huge, epic story like A Rose in the Storm would result. There is nothing that inspires me as much as an innocent heroine swept up in historical events beyond her control, and in this case, the war for Scotland’s throne. This novel is a work of fiction. However, I have tried to portray historical events and historical figures as accurately as possible. But this period in Scotland’s history is filled with conflicting accounts and huge gaps in information, leaving me to pick and choose what I want to write, and where I wish to fill in the blanks. It is also a period of myriad and ever changing politics and alliances. I have done my best to sort through what must seem to be terribly confusing characters and events. Any errors in fact are mine. For the sake of the story, I have deliberately taken a few liberties. Margaret Comyn is a fictional character, but the great Comyn family, both the earls of Buchan and Badenoch, are not. The Comyn family came to power in the north and south of Scotland in the thirteenth century, and their power increased when their relation, John Balliol, became king in 1292. 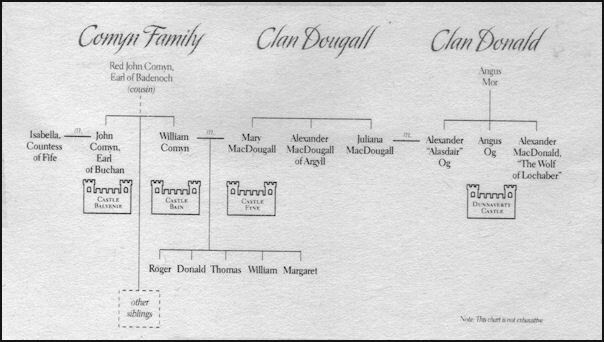 Likewise, the great Clan Dougall also became preeminent under King John. Alexander of Argyll was married to a Comyn, making for a powerful alliance between the Comyn family and Clan Dougall. The Comyns and MacDougalls fought against the English in Scotland’s Wars for Independence until the very day that Bruce murdered Red John Comyn, Lord of Badenoch, in a church in Dumfries. On that day, old alliances were broken, and new ones formed. On that day, both Comyn and MacDougall took to the field against Robert Bruce, in support of King Edward. Margaret could have existed. History in this time period is not kind to women. It is usual to find a family tree where the sons’ names are listed, but the daughters are unnamed—although their husbands might be named. Often the birth of a female was not even recorded. Her father, Master William, was supposed to have received the bishopric of St. Andrews, and was disappointed when he did not. I have discovered nothing else about him. But that is the beauty of this time period—sometimes, historical details abound, more often, they do not. And then the lucky author—me—gets to fill in the gaps. Alexander MacDougall of Argyll did have two sisters, Mary and Juliana. When I first “invented” Margaret, I gave her a MacDougall mother: Mary MacDougall, a completely fictional character. Imagine my surprise when I learned that Alexander of Argyll really had a sister named Mary, and therefore, he was really Margaret’s uncle (another invention of mine.) However, in history, Mary was married to three other men; it is pure poetic license on my part to have had her married to William. Unless, of course, she was married a fourth time…. But he could have existed, as well. Angus Mor had two sons, Alexander “Alasdair” Og and Angus Og, as I have described. The enmity between Clan Donald and Clan Dougall was a blood feud. Yet Alexander Og did marry Juliana MacDougall, sometime before 1292. It is not clear why, or how the union came to be. Some historians believe that Alexander Og died in 1299 in the Massacre of Clan Donald. Others believe that he died in 1308, when he was captured while fighting against Bruce—having taken his wife’s family’s side in the war. If he did die in 1299, then no one quite knows who the other Alexander MacDonald was in 1308, or where he came from. In 1309, Bruce wreaked his vengeance upon the Comyn family in the north of Scotland, ending their power for all time. A deliberate misrepresentation on my part was the battle led by John the Lame of Argyll against Robert Bruce and his men in the late summer of 1306, when Bruce and his army were in hiding after the massacre at Methven. There were two battles, not one. After the first successful attack, Bruce sent the women to a castle on a nearby loch for safety, and then there was the second, as devastating, attack. He then sent the women and his warhorses back to Kildrummy as I have described, while he made his way across Scotland and to Dunaverty. Sir Guy is also a fictional character, Guy being a family name (Aymer had an uncle of that name.) But the mighty and oh so impressive Aymer de Valence—who was King Edward’s military commander in Scotland, and the following year, became Earl of Pembroke—was not. And finally, there is Isabella, both the Countess of Buchan and the Countess of Fife. Poor Isabella. She did ride away in the middle of the night to attend Bruce’s coronation, and stand in for her brother, the Earl of Fife. One can only assume that her husband, the Earl of Buchan, was enraged. Gossip held at the time that she and Bruce were lovers. And her fate was to be captured with the other women at St. Duthac, and imprisoned in a cage for four years. She was moved to a friary, perhaps because she remained an important prisoner, at which point, her fate remains unknown. I have always been fascinated by the struggle of women to find courage and strength in bygone times of great adversity, when all power was reserved to men, when women were either chattel or pawns, and merely wives and mothers. I hope you have enjoyed Margaret’s story of struggle, challenge and survival—and yes, of love.